Approximately 700,000 people have surgery to remove their gallbladders annually, according to 2004 estimates by the National Digestive Diseases Information Clearinghouse. Your doctor may prescribe a low-fat diet for you after surgery to promote healthy digestion during the recovery phase. A low-fat diet calls for reduced intake of eggs. Discuss your diet with your doctor if you have questions. The main function of the gallbladder is to store and excrete bile, which is essential for the digestion and absorption of fats. The liver produces bile, which is concentrated and stored in the gallbladder, and then excreted into the small intestine where it aids in the digestion of food. When the gallbladder is removed, the bile that enters the small intestine is less concentrated, which may cause fat indigestion, malabsorption and abdominal pain. A low-fat diet that minimizes eggs and high-fat foods can alleviate discomfort and promote healthy digestion. Most people can gradually progress from a low-fat diet to a regular diet over time. One egg contains approximately 4.5 grams of fat, or approximately 10 percent of the daily fat intake recommended on a low-fat diet after gallbladder removal. The amount of fat allowed on a low-fat diet varies, but the typical fat allowance is 40 to 60 grams of fat per day. The amount of fat in an egg may be difficult for you to tolerate following gallbladder removal surgery, or too high for you to incorporate into your daily fat allowance. You can eat eggs in moderation on a low-fat diet. You can likely tolerate up to three eggs per week, prepared only with fat from your fat allowance, or no more than one egg per day. Egg whites and fat-free egg substitutes are better choices when following a low-fat meal plan after gallbladder removal. 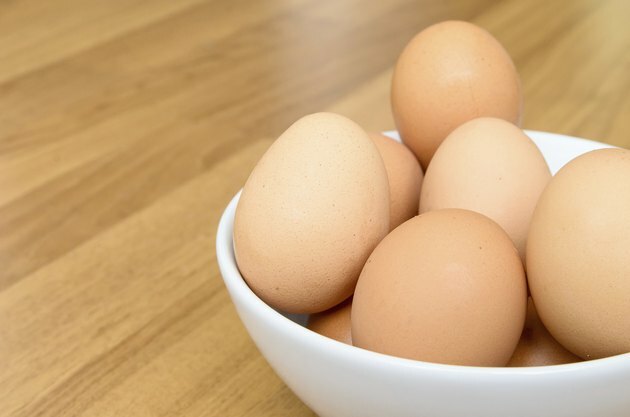 If you are following a low-fat diet and enjoy eggs daily, try combining one whole egg with several egg whites or fat-free egg substitute so you can enjoy your eggs while staying with your daily fat allowance. To further reduce fat intake, use fat-free cooking sprays on pans instead of butter, margarine or oil. Replace whole milk in egg recipes with skim milk or water. The type of diet your doctor prescribes after surgical removal of the gallbladder is based on your individual needs, including past medical history and type of surgery. Unnecessarily limiting fats in your diet may place you at risk for nutritional deficiencies. Always consult with your physician before starting a new dietary plan. Krause's Food, Nutrition, &amp; Diet Therapy; L. Kathleen Mahan, MS, RD, CDE, et al.